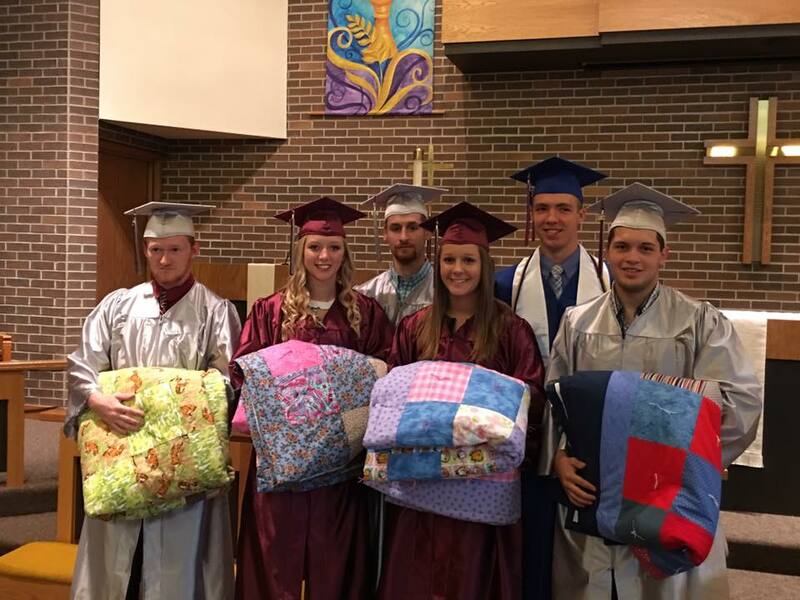 I was recently able to help out the Calmar Lutheran Church with a quilt for their beloved Pastor Phil and his wife Pastor Virginia “Ginny” Olson, who were retiring. My friend Lana contacted me about quilting it in a timely manner and of course I said yes. I was able to complete it in about a week and have it to their binder, so she could finish it. 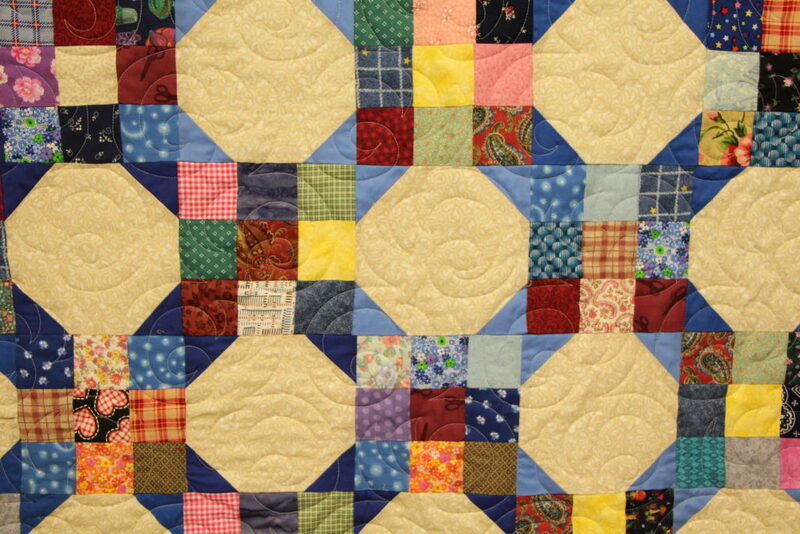 The quilt was 92 x 105, and it is a 9 patch and snowball alternating block quilt. The quilter tells me this is a pattern she found and has been wanting to try it for a few years, and she has found this is a great pattern for scrap fabric. I quilted it using the Plush pantograph with cream thread to coordinate with the fabric. The blue flowered border fabric and the cream fabric were purchased, all the other fabrics were from her stash. The pattern and the fabrics complemented each other. 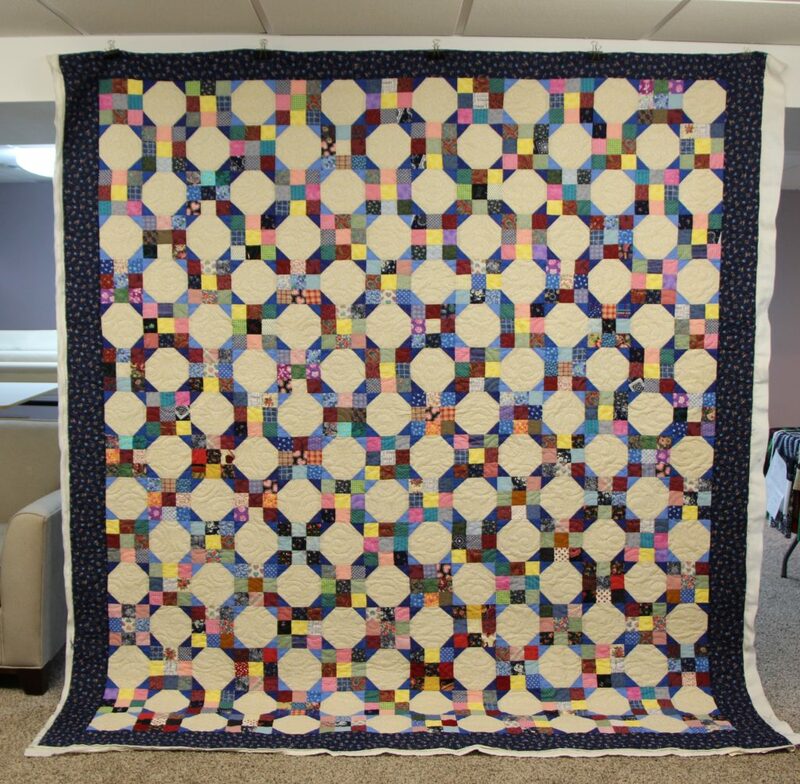 A little background on this quilter, who requests to be unamed, has made many quilts, she could not recall how many but she did know she has kept 8 quilts along with some wall hangings. She tells me she enjoys quilting and she is good friends with her sewing machine! She comes from a very talented family with diverse creative interests and sewing is her talent. 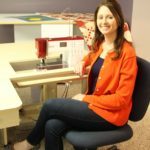 This quilter is noticing a shift in the making of quilts now, she sees more quilters making “works of art” quilts, not quilts for function or use. 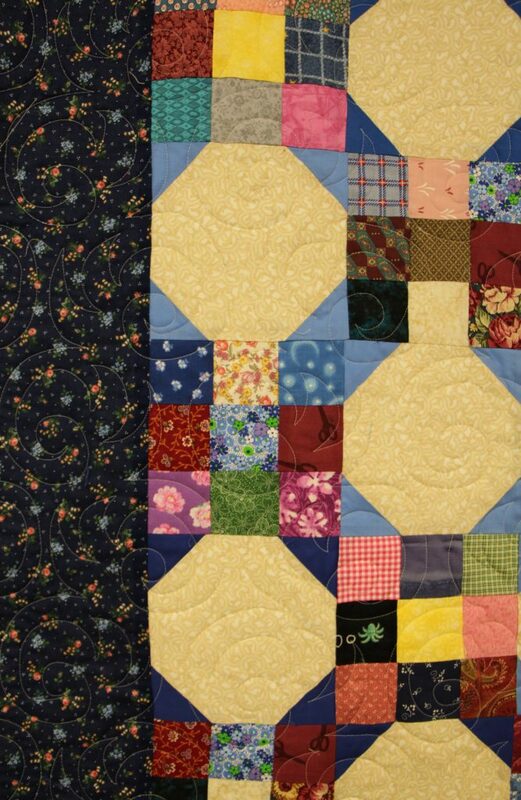 She also notes that this generation would rather buy a “modern” quilt at a department store, rather than receiving a scrap quilt. She also makes quilts for the high school seniors who belong to their church. I know of many churches in this area who do this. Such a wonderful, thoughtful handmade item to bring with you as you leave home for school or work. A constant reminder from those who serve the church and a reminder of your faith. This quilter also makes quilts for Lutheran World Releif charities and T-Shirt quilts as well. It sounds like she does it all! This gal is just one of several quilters at her church who work together to serve. Tell us about your church or charity that you sew for, I know there are many, many quilters out there donating their time, fabric and talents to help others. This entry was posted in Uncategorized on August 10, 2017 by Carla.